Dr Elaine Byrne (above) spoke at the MacGill Summer School in Glenties, Co Donegal On Monday on the module entitled The Mahon & Moriarty Tribunal Reports- How Was It Allowed To Happen? “The title of my short speech is Official Ireland and how official Ireland has tended to see things in the past. So the title of this is Why Mahon and Moriarty Was Allowed To Happen? But this is not about Mahon and Moriarty. This is about the Ryan Report, the Murphy Report, the Ferns Report, the Cloyne Report. It’s about the Morris Tribunal. It’s about what happened with that Dr Neary in Drogheda and it’s about every single inquiry in public life that we’ve had in Ireland in the last 15 years because a lot of the same things happened. For instance, in the Ryan Report, you have this incredible piece of testimony from a guard. A policeman. A man, the upholder of law and order, where he writes to the Department of Education in 1949 about his concerns about an industrial school. A guard is writing to the Department of Education about his concerns about an industrial school. Not the other way around. That’s what Official Ireland did in the 1940s, 50s, 60s, 70s and 80s in relation to child sexual abuse in this country. And when people, like, awkward people, people that kept asking questions, people like Frank Crummey, the social worker. He kept writing to the departments in social welfare and kept confronting the people who were involved. He was threatened with physical violence and social ostracisation that his family first endured when he spoke about child abuse in the Christian Brothers 40 years ago. And the other interesting thing that I found out about the Ryan Report was the Department of Education’s attitude to people who complained such as Tim O’Rourke. And, according to the Ryan Report, it was not about how to investigate his complaint but what to do about a troublemaker who had complained. And that really was Official Ireland’s attitude to many things in public life – whether it was the church or the other inquiries that I’ve listed. And often it was outsiders who spoke the truth. It was people like Eugene McErlean, from Northern Ireland, the former head of the AIB who blew the whistle on fraudulent practices within the AIB in the early 2000s. Or a man like Patrick McGuinness, who was the accountant for Larry Goodman who was interviewed by Susan O’Keeffe when Susan O’Keeffe was a journalist in the UK. Not a journalist in Ireland, a journalist in the UK. And Patrick McGuinness had emigrated to Canada. He wasn’t able to say what he wanted to say from Ireland. And you had people like Joe Murray and Padraig Mannion who demonstrated how there was fraud within the meat industry. And for their troubles an apology – I’ll come back to apologies in a moment – an apology was demanded and they were disciplined for their troubles. And there’s a whole series of people in Irish public life, like those people I’ve mentioned and, in particular, someone like Joe McAnthony. In 1973 he wrote about the stuff that Michael [Smith,Village magazine] spoke about, the stuff we already knew. But 40 years later it took for the Moriarty Tribunal, the Mahon Report and the McCracken Tribunal to confirm what he had already said. And in an interview he did, in his experience, of being the troublemaker, of asking questions..
And that’s what Official Ireland has done to individuals who have tried to speak the truth. And I would argue that perhaps we’re still doing it. And I would also argue that people like Joe McAnthony and Padraig Mannion and Joe Murray and Sheenagh McMahon, who was the whistleblower in the Morris Tribunal.People like Michael Smith, and other people – there should be some official acknowledgement for their duties and citizenship that they have done and the service they have given to this country over a number of years. There should be, whether it’s a reception with the President, whether it’s an acknowledgement by the Taoiseach, I don’t know what it is. But those individuals should be thanked for what they’ve endured in Ireland over many, many years. But it’s not just the past that we dismiss people. And it’s not just the past where we have attitudes towards things that we form together. And that wonderful word that’s come up quite regularly in Ireland in the last while. We saw it last October/November. When on an RTE television programme, with 900,000 viewers on a Monday night, when Sean Gallagher was speaking on the Frontline and he was asked a question about a tweet. In the import of the tweet he was asked about a claim about fundraising he was engaged in. And the reaction by many people in October/November last year was ‘Well, it was the way he used the word envelope. It was the way he reacted. It was his fault.’ It wasn’t the process or the context of what had happened in that incident. That election was on a Thursday. The media ban came in on the Tuesday, the Wednesday. And at that point, according to the polls, Sean Gallagher was 13% ahead in the polls. Now irregardless of who got elected, it’s not about the individuals concerned. But we were electing the first head of our state and I would argue that a very large number of people changed their mind because of what happened in that programme that night. And essentially what Sean Gallagher was asked was the truth about a claim on unorthodox fundraising. And the person who asked him that question was a man who was a convicted fuel smuggler and a man who had also been found, subsequent to the election, to have been given €3,000 by Martin McGuinness for fuel during the campaign. And then there was an apology by the director general. But somehow there’s still this attitude out there that it was the way he reacted, it was his fault. ‘Earlier last week, I had my first conversation with James Osborne, the former chairperson of Independent News & Media, who was voted out in an O’Brien-led boardroom bloodbath at the AGM. In the course of the conversation, he informed me that in April of this year Denis O’Brien, the major shareholder in INM, had called him to get him to “pull” an article in this newspaper. The article related to Denis O’Brien’s borrowings from Anglo Irish Bank. A spokesperson for Denis O’Brien yesterday denied that this took place. Osborne says he talked him down, telling him he was behaving like a “spoiled teenager”. The article was published under the heading ‘Anglo Irish’s Top 13 Buccaneer Borrowers’. It was fair to Denis O’Brien, making clear that he was one of those paying the bank back. O’Brien knew of it because we had contacted him for comment. That was an editor of the best-selling newspaper alleging media interference by the owner of that newspaper. Not a single other newspaper, or other media outlet, picked up on that story. Because Anne Harris wrote it. And because it was in the Sunday Independent. And because Official Ireland has decided that this is an internal, boardroom battle with the Sunday Independent and, you know, that’s just how things are and ‘sure, that’s the Sunday Independent’. And I would argue that just in the past, how we have dismissed certain views and attitudes towards things, we’re still doing it. And we’re still treating people who have things to say with the disrespect that they don’t deserve. So I just want to let you know about media freedom and what it means. This is quotes from the libel letter that Denis O’Brien sent to me last year. It was widely reported at the time so I don’t think I’m breaching any confidence. I remember getting it. I was in the Political Science Association of Ireland annual conference in the Royal Irish Academy and I got it on my mobile phone. And the word was forwarded to me by somebody within the Independent group. And the title of the email was ‘Remember to breathe’. And I remember getting it. And, as it happened, Phil Hogan was the guest speaker and I remember putting my hand over my mouth in different parts when I was reading this six-page letter from him, thinking I have €3,000. Does he have €3billion or is it €4billion. And these letters have been sent in the last 10 years by the largest media owner of this state to 17 different journalists, according to the National Union of Journalists in Ireland. And the purpose of letters like this is to stop you writing. It’s to create doubt about what you’re saying. And it’s a very subtle way of stopping you write, which I haven’t done. There was no apology and there was no retraction. grew up in a pub and I had a very intimate surroundings that I had to observe things like alcoholism. And alcoholism is a disease with denial at its embedded defence mechanism. Denial punishes those who seek to challenge the behaviour of the alcoholic. It’s easier to avoid than acknowledge. To ignore than confront. And eventually the problem grows into the large white elephant in the small room that everybody walks around and kneels under, while pretending that everything is perfectly normal. And it’s in that pretence that enables and allows that alcoholic to function because the enabler and facilitator subconsciously accepts this behaviour and then ultimately become responsible for it. The enablers and facilitators are a part of the problem, not just the alcoholic. The refusal to recognise the fundamental difference between right and wrong poisons all those who come into contact with the alcoholic and excuses are made for the behaviour, in order to protect a reputation. Enablers and facilitators become obsessed about the maintenance of secrecy, the avoidance of scandal, the protection of reputation – the words of the Ryan Report. All other considerations are subordinated to those priorities and this enabling phenomenon has many forms but always the same outcome – it allows the alcoholic to avoid the consequences of their actions and prolongs the behaviour in the first place. And it also gives impunity to those who were responsible for it in the first place. And it prolongs the fundamentally flawed system. So I’m looking around here and I looked at the programme this morning and I see what is, and what I would describe, as Official Ireland. It is predominantly male, predominantly over 50, predominantly people who earn over €100,000 generally. Not in my case. I’m probably making too many generalisations there. But it is people that think in a particular way and isn’t always challenged about different ways of looking at things. 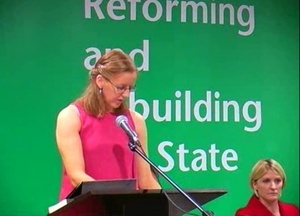 Posted in Misc and tagged Elaine Byrne, MacGill at 3:50 pm on July 25, 2012 by Broadsheet.